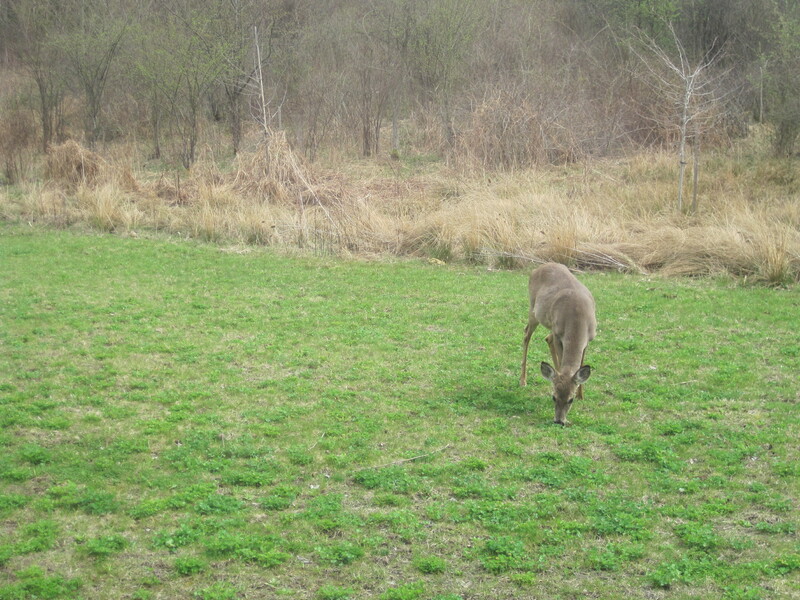 A deer feeds on clover on Earth Day this year. In the background are the tupelo trees we planted last year on Earth Day. First things first, this is not the as promised conclusion to ‘Ranking Movies My Kid’s Watch’ as I promised in my last post. Normally I’d keep putting it off and not write about anything else, but because this is Earth Day I felt compelled to leap-frog and write a post today. I’m trying to include my wife in on the movie decision process, but the votes are not in yet; we are still evaluating. One more aside, as I write this she just texted me that she had a tick on her forehead, so tick season is officially underway. I’m sure I’ll be under strict orders to build a guinea fowl house this weekend. I’m not proud, I will freely accept donations of time, money or materials to rid our land of ticks. She isn’t even outside, she’s working. The tick must’ve come from my car or something. Ugh I don’t have the capacity to deal with all of this. Okay, back to Earth Day. It’s a special day because it marks the 2nd anniversary of our moving into our home. It was merely a coincidence but I like that the house move anniversary falls on this day because of all the environmentally sustainable things we did in building the house and landscape. We’re planning on going out and buying a small tree to plant to mark the occasion later today. I’ll share that adventure in a future post. I’m thinking something with nuts so we can attract more squirrels. Of course any tree we buy will be tiny – thus any nuts, and subsequent squirrels will come roughly forty years after I’m dead. Oh well, it’s the thought that counts right. I’ve been super busy in the garage and outside working on the sand box, so I’ll have upcoming posts on those activities as well (hopefully I’ll have some useful tips and tricks for the DIY’er inside of you or in your household). But I will wait to post those after posting part 2 of the movie ratings, as promised. For Earth Day, here are my informal tips for making your home more eco-friendly. As for electronics, there should be local companies or even community events to take your used computers, batteries, cords and whatnot to get recycled. Either erase computer hard drives or take make sure the recycling company will erase the contents. Also check to make sure they’re not sending your waste overseas to China or India – it’s not uncommon for the U.S. to send e-waste overseas for disassembly in less than socially or environmentally responsible ways. Food can be recycled by starting a compost pile in your yard. There are plenty of sources on the web and at your local garden center to help you on the path of composting. Reduce – And on that note, throwing away stuff that you paid good money for, think about reducing the amount of stuff you bring into your home. Work to buy things that are durable or can be repaired. This is hard to do with kids, trust me I know – often times you can’t control what comes into the house in the form of gifts, impulse buys or gifts of appeasement. If you need something, do your homework and be an informed consumer. Read reviews, understand your needs and vote with your money. Buy from companies that are working to preserve the environment and social well-being. Support their bottom line and reward their initiative with your dollars. I’m a believer in capitalistic free-market karma. LED Light Bulbs – Do yourself a favor, start buying LED light bulbs from now on. The price has come down significantly, they last over 20,000 hours in some cases, and they pay for themselves in energy savings in a matter of just a couple of years. Since they last so long, they also reduce your maintenance workload which means more time golfing and less time running up to Lowe’s. Plus lowering your electricity bills every month means more money to spend on golf balls. LED’s are available in a wide range of color temperatures from cool to warm, as well as various shapes for every application in your home. Eliminate Plastic Grocery Bags – No. 4 Plastic bags, like those you get at the grocery store are impossible to recycle with other plastics. Do not place these in your recycling bin. Instead gather them, and other clean No. 4 plastic bags, and recycle them at the grocery store. Better yet, try to eliminate them all together by using reusable cloth bags to get your groceries. The cloth bags are great because you can load them up with more items than plastic or paper bags, which means fewer trips from the car to your kitchen. Make Your Yard Nature Friendly – There are all kinds of things you can do outside to make your yard more nature and family friendly. Use natural fertilizers and stop using harmful petroleum-based fertilizers. You ever notice the little “keep kids and pets off” signs those landscapers put up after fertilizing people’s lawns? Why would you want something on your lawn that could kill your kid, just so you can have grass that is greener than your neighbors? We need to stop having perfect grass as the universal symbol of happiness in our residential world. There are plenty of organic ways to encourage grass to grow. And while you’re at it, plant grasses that require less maintenance and water. Additionally clover is a great plant for your yard. Bees and deer love clover, and it stays green year round. Set up a rain barrel to collect free rain water from your gutters that can be used in your garden or yard for irrigation. Plant native trees, plants and flowers. Not only will the bees and birds love them, they also require less watering (if any watering at all) and are naturally tolerant of your locale which means less maintenance (and more time golfing). Speaking of wildlife, create habitat for them to live and raise their young. Plant milkweed for monarch butterflies. Native wildflowers and clover for bees. A brush pile for small mammals. An overturned pot with a “door” for toads. Build and mount a bat house, or box for nesting owls, ducks or birds. What tips do you have to save time, money and help the environment in your household? This entry was posted in Cool Stuff, Land, Living There, Saving The World, Sustainable Features and tagged land, nature is awesome, recycling, sustainability by Chris. Bookmark the permalink. I switched to LED lightbulbs– it’s the perfect marriage between sustainability and my persistent laziness in just living in darkness because I can’t be bothered to change a light out. Laziness drives a lot of what I do in sustainability and life in general. I don’t think it’s a totally bad quality. Lazy in that I’d rather do stuff than change light bulbs.